"HANS" redirects here. For other uses, see Hans (disambiguation). A HANS device (Head and Neck Support device), is a product which is part of a family of devices known as head restraints. Head restraints are safety items which are mandatory when competing with most major motorsports sanctioning bodies. These devices reduce the likelihood of head and/or neck injuries, such as a basilar skull fracture, in the event of a crash. There are many such devices on the market today, but the HANS is the original and the most common. 1. HANS device, 2. Tether (one per side), 3. Helmet anchor (one per side), and 4. Shoulder support. Primarily made of carbon fiber reinforced polymer, the HANS device is shaped like a "U", with the back of the "U" set behind the nape of the neck and the two arms lying flat along the top of the chest over the pectoral muscles. The device, in general, is supported by the shoulders. It is only attached to the helmet, and not to the belts, the driver's body, or the seat; the helmet is attached to the device with the help of an anchor on each side, much like the Hutchens device, but placed slightly back. In a properly installed 5- or 6-point racing harness, the belts that cross the driver's upper body directly pass over the HANS device on the driver's shoulders and they buckle at the center of the driver's abdomen. Therefore, the HANS device is secured with the body of the driver, not the seat. The purpose of the HANS device is to keep the head from whipping fore and aft in a crash, preventing excessive rotational movement as a secondary protection, without otherwise restricting movement of the neck. In other words, it allows the wearer's head to move normally, but prevents or restricts head movements during a crash that would exceed the normal articulation range of the musculoskeletal system and cause severe injury. In any kind of crash, the person's body, which is not protected, is decelerated by the seat belt, with the head maintaining velocity until it is decelerated by the neck. The HANS device maintains the relative position of the head to the body, in addition to transferring energy to the much stronger chest, torso, shoulder, seat belts, and seat as the head is decelerated. The device was designed in the early 1980s by American scientist and researcher Dr. Robert Hubbard (1943–2019), a professor of biomechanical engineering at Michigan State University. After talking to his brother-in-law, accomplished American road-racer Jim Downing, following the death of Patrick Jacquemart, a mutual friend who was killed in an International Motor Sports Association (IMSA) testing accident at the Mid-Ohio Sports Car Course when his Renault Le Car struck a sandbank, leaving him dead on arrival with head injuries, IMSA officials decided that some sort of protection was required to help prevent injuries from sudden stops, especially during accidents. A major cause of death among drivers during races was through violent head movements, where the body remains in place because of the seat belts, but the momentum keeps the head moving forward, causing a basilar skull fracture, resulting in serious injury or immediate death. While death from such injuries is usually immediate, some drivers have survived basilar skull fractures, such as NASCAR's Ernie Irvan and F1's Philippe Streiff. Hubbard had extensive experience as a biomechanical crash engineer, including in General Motors' auto safety program. His first prototype was developed in 1985, and in crash tests in 1989 — the first to use crash sleds and crash dummies using race car seat belt harnesses — the energy exerted on the head and neck was lowered by approximately 80%. After major racing safety companies declined to produce the product, Hubbard and Downing formed Hubbard Downing Inc., to develop, manufacture, sell and promote the HANS in 1990. However, the product languished until 1994, when Formula One showed interest in the wake of the deaths of Roland Ratzenberger and Ayrton Senna. In 1999, CART driver Gonzalo Rodríguez was killed after suffering a basilar skull fracture in a crash. At the same time, Mercedes was completing research of the HANS on behalf of the FIA for Formula One, finally deciding that it out-performed their airbag project. The device was first adopted by the National Hot Rod Association (NHRA) in 1996, following the death of Top Fuel driver Blaine Johnson, (but was not mandatory in the series until 2004, after the death of 2003 Top Fuel Rookie of the Year Darrell Russell, who was killed by flying debris during the Sears Craftsman Nationals in Madison, Illinois). Other racing series were also slow to follow suit. Many drivers, including Dale Earnhardt, resisted the HANS devices or anything that was similar to them, claiming that they were uncomfortable, and more restrictive. There was also fear that it would cause more injuries and problems than it prevented. Some even stated that the positioning of the device made the seat belts feel less secure or rubbed on the shoulders or the collar bone. Earnhardt referred to the device as "that damn noose", claiming the tethers would more likely hang him than save him in the event of a crash. Media members immediately turned the focus on the HANS device after the death of one of the most famous racers in history. On February 18, 2001, in a live nationally televised event seen by more than 17 million viewers, seven-time Monster Energy NASCAR Cup Series champion Dale Earnhardt was killed on the last lap of the Daytona 500. Earnhardt was the fourth NASCAR driver killed by basilar skull fractures during a eight-month span, following Adam Petty in May of 2000, Kenny Irwin, Jr. in July of 2000, and Tony Roper in October of 2000. While it is still debated whether Earnhardt's death was the result of a broken seat belt, or an inadequate head and neck restraint, he died of a basilar skull fracture, which likely would have been prevented by the proper use of belts and a head and neck restraint. "... (I was) shocked by that. I recorded about 80 entries in my telephone log the first day [after the fatal accident]. And I didn't even write them all down. I was on national television ten times that Monday. I had been down in Florida and came home on Friday and went cross-country skiing in Michigan. So, I didn't know he died until I got home and there was voicemail on my answering machine at 10 o'clock at night. I actually had two interviews that night before I went to bed." Even after the infamous death, use of the HANS device or similar products was resisted. The week after Earnhardt's death, Mark Martin said at Rockingham, "I would not wear one for anything. I'll just keep my fingers crossed and take my chances". Following an extensive investigation into Earnhardt’s death that ended in August 2001, NASCAR did not make any immediate changes regarding use of HANS. <url=https://www.nytimes.com/2001/08/22/sports/auto-racing-panel-releases-report-on-earnhardt-s-death.html Then on October 4, 2001, in an ARCA race being held in conjunction with the fall NASCAR racing weekend at the Charlotte Motor Speedway, Blaise Alexander was killed in a two-car incident while battling for the lead in the final laps of the race. Ironically, the other driver racing for Alexander for the lead was Dale Earnhardt's oldest son Kerry Earnhardt. The younger Earnhardt's car flipped on its roof after Alexander went into the wall, but he was in the lead when the race was halted with four laps to go. Due to carnage of the accident, the race was never restarted, so Earnhardt was declared the winner. NASCAR mandated use of the HANS device in its top three series on October 17, 2001. Formula One mandated HANS devices in 2003 after extensive testing by Mercedes from 1996 to 1998, sharing the results with other Fédération Internationale de l'Automobile (FIA) affiliates. Using that information, CART made the device compulsory for oval tracks in 2001, later requiring the HANS devices for all circuits. 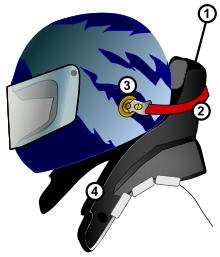 Starting in October 2001, NASCAR mandated either the HANS or Hutchens device head and neck restraint be used, going with the HANS device exclusively, starting in 2005. Automobile Racing Club of America (ARCA) followed suit in the wake of a basal skull fracture crash fatality in an ARCA race at Lowe's Motor Speedway in October 2001 that claimed the life of Blaise Alexander. The World Rally Championship and Australian V8 Supercar Series made the device compulsory for drivers in the 2005 season. Acceptance by drivers was helped by the addition of quick-release shackles developed and implemented by Ashley Tilling. They were sourced from the marine industry, being used on racing sailboat rigging. The shackles allowed the drivers a simple and quick pull to release the HANS device and exit their vehicle. The first driver to utilize them was NASCAR driver Scott Pruett of PPI Motorsports. Such shackles were also used on the Hutchens device and others. Beginning in July 2007, many sanctioning bodies have approved any head-and-neck restraint that passes the SFI Foundation Specification 38.1 standard. Those would be the HANS device, the Moto-R Sport, the R3, the Hutch-II, the Hutchens Hybrid, or the Hybrid X. Today, most major auto racing sanctioning bodies mandate the use of head and neck restraints; the FIA has made HANS devices use compulsory for all International-level events from the beginning of 2009. Even monster truck drivers use the HANS device in many events. Grassroots Motorsports awarded the HANS device the Editors' Choice award in 2002. Schilke, Nancy (2001). "The HANS Device - a head and neck support system", referenced January 23, 2005. Stonefeld, Ross (2001). "Helping HANS"
^ "HANS inventor Robert Hubbard dies". Motorsport Network. 2019-02-06. Retrieved 2019-02-06. ^ a b Hinton, Ed (2002). Daytona: From the Birth of Speed to the Death of the Man in Black. Warner Books. p. 426. ISBN 0-446-61178-6. Google Book Search. Retrieved on 2009-06-07. ^ Hinton, Ed. "Earnhardt's death a watershed moment". espn.com. ESPN. Retrieved 17 February 2019. ^ "Number of TV viewers of Daytona 500 in the United States from 2000 to 2018 (in million viewers)". Statista. Retrieved 18 February 2019. ^ a b "Kerry Earnhardt wins at Lowe's; Blaise Alexander fatally injured". motorsports.com. Retrieved 18 February 2019. ^ "NASCAR mandates HANS for 3 series". Washington Times. October 18, 2001. 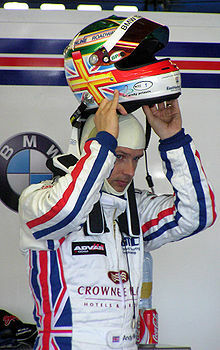 Wikimedia Commons has media related to HANS device.